When we put them in one blowy January day, there were serious doubts that they’d ever make it through the week. 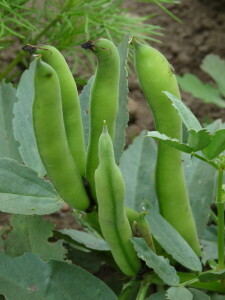 The broad beans in turn were dried out when I abandoned the seedlings for several days, then got battered by black plastic and flooded with late winter storms. But would you know it, they pulled through and the crop was good – three big pickings from 11ish (can’t remember precise number) plants. Yesterday I pulled up the last of them, podded the trugful whilst listening to Front Row on Radio 4. Also harvested the first cos lettuce – fantastic, mild and crunchy. Picking one or two courgettes now daily. All is gentle abundance.